Blogging event Regional Cuisines of India (RCI) was started by Lakshmi of Veggie Cuisine, to celebrate the rich and diverse cuisines of India, and is hosted by a different blogger each month. I think this event is a fantastic idea, because not only does it encourage us to explore the many varieties of regional Indian food, but the round-ups also provide excellent resources of information and recipes! For this reason, I’ve decided to dedicate a page to it that contains round-ups of past events, and RCIs that are yet to come, so that I can find it and refer to it easily! 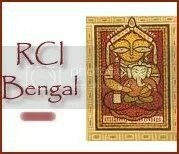 This month, we are exploring the cuisine of West Bengal, and our host is Sandeepa from Bong Mom’s Cookbook. Food is very important to Bengalis. Traditional feasts are carefully structured rituals consisting of numerous dishes, carefully and laboriously prepared, with different structures and tastes playing an important part of the meal. Such feasts are always finished off with a sweat, usually based on milk and cream, for which Bengal is famous all over India. Fish (both freshwater and sea fish) and rice are the main staples of this coastal region nurtured by the Ganges river, and a delicate mixture of sweet and spicy flavours is characteristic of Bengali dishes. Mustard oil is the preferred cooking medium, and mustard seeds and greens are also used. Mustard is indeed one of the 5 ingredients in Panch Phoron, a typically Bengali mix of equal amounts of 5 spices: fennel (saunf), nigella seeds (kalonji), black mustard seeds, cumin seeds (jeera) and fenugreek seeds (methi). Coconuts and ginger are also widely used in Bengali cooking, and a touch of garam masala is often added to the food to enhance its flavours. Other characteristic ingredients include red lentils (massoor dal), moong dal (moong lentils), poppy seed paste (posto), mustard paste and mangoes. To find out more about Bengali cuisine, please check out this interesting and informative article, as well as the Wikipedia entry on Bengali cuisine, which describes the courses in a typical Bengali meal. For a wealth of mouth-watering Bengali recipes, do check out these two fantastic blogs: Quick Indian Cooking & Bong Mom’s Cookbook! West Bengal – Wikipedia Commons As my entry, I’ve chosen this gorgeous Bengali dal. I really wanted to make this recipe from Sangeeta’s blog, but then felt a little silly submitting her her own recipe, so I’ve chosen this one, which is similar, and yet different. This recipe features red lentils, or masoor dal, which seems to be a favourite Bengali dal, judging from the recipes I found featuring this pretty little lentil. Another important characteristics is the use of Panch Phoron. The recipe has three basic steps: the lentils are cooked with turmeric and green chili, and then seasoned with onion, tomato and ginger paste; this is then seasoned with dried chilies, panch phoron and garlic tadka. 1. Rinse lentils well, add water, chilies, turmeric and salt. Bring carefully to boil and cook over low to medium heat, partially covered, for 25 minutes. Cover and cook another 10 minutes. Adjust salt. You will see the lentils go through various stages during cooking. They will first disintegrate and look like little pieces of peel. At this point, they will still taste slightly raw, and have a particular taste that I associate with raw pulses. After some time, they will disintegrate further into a velvety mush, with an addictive and comforting flavour. I find this irresistible! 2. While lentils are cooking, heat the oil or ghee in a pan. The oil is hot engouh when it starts sizzling when you insert the wooden spoon. Then add the onions and cook until they are golden brown, stirring constantly. 3. Add ginger and stir for 5 seconds. It will stick a little, but don’t worry. You’ll get it off when you add the tomatoes. Add the tomatoes and continue cooking until the tomatoes decompose into a delicious and fragrant mush, and the oil or ghee starts oozing from the mixture. Stir so that tomato mixture doesn’t stick. Turn heat to low if necessary. 4. Scrape out the tomato mixture into the lentils and stir it in. Stir in the sugar if using it. Let lentils sit while you make the spiced oil. 5. Do a quick rinse of the frying pan, without soap, and dry thoroughly, or use another smaller pan if you wish. Add the remaining 2 tbsp of ghee or oil and heat over medium high heat. I recommend using ghee at this stage, for superior flavour. 6. When it is hot, add panch phoron mix and heat until the mustard seeds begin to pop, which will take about 15 – 20 seconds. Mind the splattering! Then, add red chilies and fry for another 15 seconds, until they turn a little darker. Turn off heat and add the crushed garlic and let sizzle for about 30 seconds. Stir this mixture into the lentil/tomato mixture and cover the pan quickly to capture the aromas. Leave for a few minutes, and serve with rice. Adjust salt. We didn’t think it was hot enough. Next time, I’ll add either more green chilies, or more dried red chilies at the end. I’ll also try it with or without sugar. At one point, I thought I used too much turmeric, but I actually liked it the way it was. Red lentils, turmeric and ginger are a fantastic combination! This dal was absolutely gorgeous! We simply loved it! The husband almost liked the pan clean! Yeap, we shall be making this again! The flavours were fantastic, and came in different layers, corresponding to the three cooking stages (lentils, tomato mixture, tadka). As well as tasting great, it had this amazing orange hue that I really loved, and the house was perfumed by the beautiful aroma of panch phoron. And the 5 very lucky winners are…. I love Indian food, in fact we had some last night, but unlike you I was lazy and ordered it in. The dal looks wonderful, so colourful and rich. The dal really was wonderful! I definitely recommend it! I love Masoor Dal this way, though I don’t add the garlic. Oh, I’m sure I can smell it from here! Looks wonderful, love the spices on the top. Awesome. I know exactly what your verdict talks about. I myself made a very similar Panch Phoron Dal for Bong and I absolutely adored it! Hi, good to see you are still blogging – this food blog looks tasty. Great images too. We’ll have to try some recipes. Hope you review Oxford restaurants in case I’ve missed some good ones. I’m working on an Oxford pub blog for next week probably. The research is fun! This is not the actual recipe of panch phoran. Instead of mustard seeds “randhuni” which looks very similar to ajwain goes in thr recipe. MEDHAA, thanks! And welcome to my blog! SANDEEPA, it’s great to see you here! I love your blog, btw! ZLAMUSHKA, yes, I saw your dal! Looks great! CASSIE, Welcome, and thanks for visiting! Do try panch phoron, it’s delicious! Just a word of warning though: fenugreek is quite bitter, so start by using small quantities. SARAH, thanks for visiting! Glad you like the blog. I am planning to do more cookbook reviews, as well as restaurant reviews, but really haven’t got to it yet, as life got very busy! Hey, drop me a line when you do your pub post. I did one here, too. Btw, what is radhuni like? Do you know if it’s available in the UK, by any chance? Thanks! I am from Bengal:-) & this dal is the most gorgeous I ever saw. Panch Foron has mustard not radhuni, tho radhuni(very close to celery seeds) is used as a spice.. U are RIGHT! Kada sam prvi put probala sočivo nije mi se svidelo.. ali poslednjih godina sočivo je nezaobilazno na našem stolu. A ovo je jedno od jela koje volimo. Samo što zbog male dece ne dodajem djumbir, čili… ali ponekad za sebe i muža napravim baš ljutu dhal što mi prija..
Dodavala sam Fenugreek seeds ili ti piskavicu ali ne i ostalo iz ovog mixa koji ti koristiš .. moram da napravim mix pa da probam. Feel heavenly. Taste and feel like heaven. I just tried this dal and it’s the most delicious I’ve ever made! Thanks for sharing a recipe with such a wonderful depth of flavor. This is also a good reminder to use my bag of panch phoron more often.